Jimmy Styks has become a popular choice for paddle boarders since coming onto the SUP scene in 2009. The company offers a diverse range of inflatable SUPs that appeal to many paddlers. Jimmy Styks inflatable paddle boards range in size from 10.4ft to 14ft in length. They also have two inflatable surfboards, a 6ft shortboard and an 8ft longboard. Their boards come with all the paddle board accessories you need to start paddling. In our review, we’ll look at 3 Jimmy Styks paddle boards. We’ve also included specs for each model and why we picked them to help you choose the best Jimmy Styks paddle board. If you’re looking for a paddle board with an extra-wide platform for maximum stability while paddling, Jimmy Styks 11' 2" is ideal for you. It’s flexible for use on flat-water and offers an all-around performance on various environments due to the conservative-moderate hybrid rocker curve making it our top-rated Jimmy Styks SUP. This board has a curved tail rocker to keep the nose above wind chopped water and a flat nose rocker to allow smooth planing on flat-water. The Jimmy Styks hybrid features a padded SUP board bag for storing essentials and is a great choice for beginner paddle boarder. An integrated utility tie-down bungee system will allow you to safely secure SUP life-vests and belongings. Packing and bringing along a paddle board with you has been made easy with Jimmy Styks Airsurf6 roll-n-go portability feature. You’ll be able to travel with your board wherever you go. This board is also ideal if you don’t have enough storage space at home since it’s a shortboard. It’s a lightweight surfboard that’s great for beginners and intermediate paddle boarders while agile design will enable you to maneuver smoothly through the water. 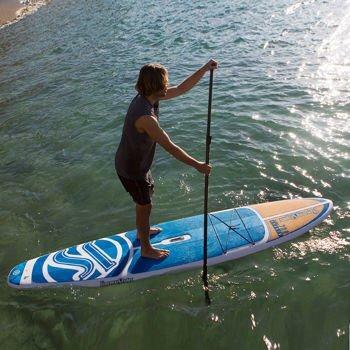 Jimmy Styks inflatable paddle board has a dual layer fusion construction which reduces weight while delivering high marks when it comes to the overall durability and rigidity. Planning to venture into the water sport of stand up paddle for the first time? Jimmy Styks soft top paddle board will perfectly suit you. Soft top boards are a great choice for beginner paddlers and intermediates. The Jimmy Styks Amberjack delivers outstanding stability, rigidity and durability at a lighter weight. With its rigid construction, the board offers an unforgettable paddling experience. This board features a comfortable soft foam layer on top for maximum comfort, utility tie downs to keep travel gear secure, adjustable aluminium paddle and a leash. The length of a board plays a major role in determining the performance of the board. Longer boards are usually faster compared to shorter ones. However, shorter boards are more maneuverable. Also, think about your intended use. Shortboards below 10ft are great for kids or beginners who want to learn SUP surfing. They’re more maneuverable than longer boards making them ideal for surfing waves. Medium boards between 10ft – 12ft are perfect for SUP yoga and all-around use. Long paddle boards measuring 12.6ft and above are ideal for racing or touring and fast paddling. They tend to track straighter and are faster than short and medium boards. A wider board is more stable however it can be difficult to paddle if it’s too wide for you. SUP width range from 25 inches to 36 inches. When choosing the width of your SUP, consider your body type, type of paddling you’ll be doing and ability level. If you’re a big rider, go for a wider board and if you’re a smaller rider, pick a narrower board. A smaller rider will find their balance on a narrow board while a bigger rider will struggle to do so. And if you put a smaller rider on a big board, they’ll struggle to reach out to the side to get their SUP paddle in the water. If you’ll be going on long trips that require you to carry extra gear, choose a wider board to have more storage space. A board that’s 31 inches wide or more is ideal if you want to do yoga. It will give you space and stability for doing SUP yoga poses especially if you’re a beginner. If you want to race or surf, go for narrower boards. They’re more maneuverable and faster. You may be comfortable on a narrower faster SUP if you’ve paddled a lot. However, a beginner may prefer a little extra width to help them secure. The materials used in constructing a paddleboard will determine how long it will last. Jimmy Styks paddle boards are built using two layers of drop stitch materials and other technologically advanced materials to provide increased stiffness and rigidity. When choosing a paddle board size, pick one that has enough volume based on your experience level and weight to help you keep afloat. The size also depends on your height and type of paddling you’ll be doing. 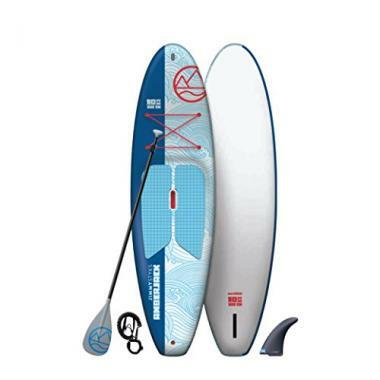 An inflatable stand up paddle board is less expensive compared to a regular board. 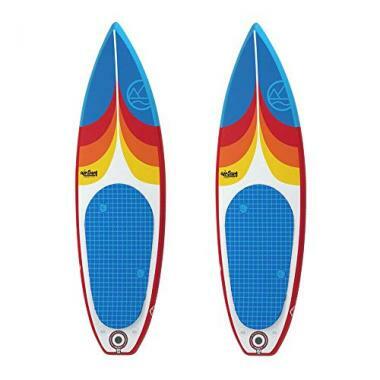 Inflatables allow for an affordable price-point making them a good stand up paddle board for beginner paddle boarder. Paddleboards that cost around $300 may not be good. You’ll be disappointed by its performance on the water or even break quickly. Appropriate price for a quality board is usually about $400 and more. Two layers of drop-stitch material fused in the manufacturing process to provide increased rigidity and stiffness while decreasing weight. A layer of durable PVC material with thousands of threads connected to the top and bottom to help the board maintain its shape. Multiple layers of fibreglass and epoxy around an expanded polystyrene core and wood stringer for maximum strength. Q: Why Choose Jimmy Styks Paddle Board? A: Jimmy Styks paddle board is lightweight and rigid. Here are other reasons why you should choose their boards. They’re affordable making then a good board for beginners who may not be able to buy expensive paddle boards. They’re versatile and can be used for a variety of paddling activities and conditions. Q: What Are The Pros And Cons Of Jimmy Styks Paddle Board? Their stability on the water makes them more maneuverable and faster. They have a soft foam layer on top for comfort and a great choice for those paddlers starting in stand up paddling. They’re cheap paddle boards and will still provide the same fun as more expensive boards. Q: What Is The Difference Between A Regular And Jimmy Styks Paddle Board? They’re designed to be compact and can deflate easily and quickly into a smaller size. Easy to carry due to their compact size when deflated. You can even tuck them under your arm. Their lightweight nature opens up the possibility of paddle boarding to a wider range of paddle boarders because they don’t weigh more. 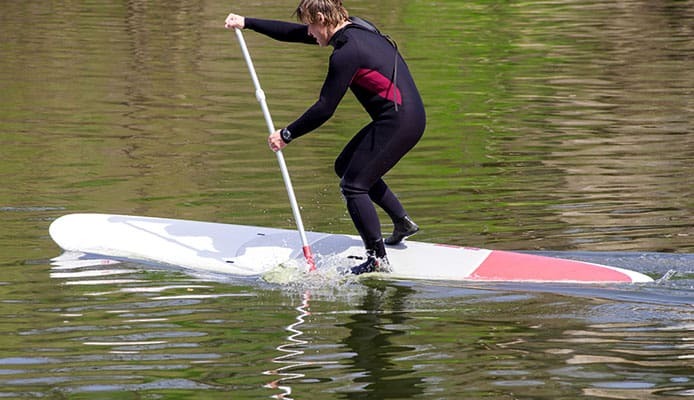 They’re stable on water and will allow beginners to enjoy SUP fishing or yoga without tipping over. Jimmy Styks offers well rounded inflatable paddle boards that won’t break the bank. Their paddle boards are of high-quality and well designed to allow you to enjoy paddleboarding. We hope our detailed reviews will help you choose the paddle board that suits your preferences.